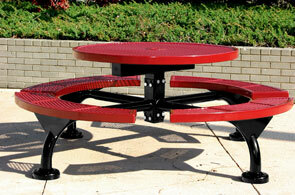 The Span Style outdoor round table is perfect for social eating areas. 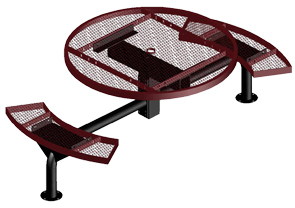 The round design makes it easy to interact with everyone at the picnic table, and the 3/4" # 9 expanded metal top and seats allow for long lasting comfort and usability. Easy access 2-7/8" O.D. span style frames provide ultimate support to this attractive yet functional table. 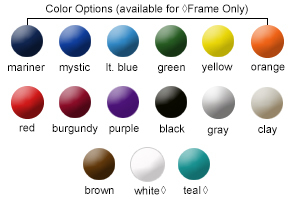 Both in-ground and surface mount models are available with optional cast aluminum grout covers that are powder-coated to match the frame color. For protection against weathering and corrosion, top and seats are thermoplastic coated with a lightly textured matte Polyethylene finish.